With all the excitement over the past weeks about Wikileaks' diplomatic cables, the Nixon Presidential Library and Birthplace Foundation's release of 265 hours of new Nixon tapes on December 9 barely registered in the public consciousness. Reporters, bloggers and activists around the world have devoured the cables' gossip and insight into the lives and minds of the world's diplomatic and political elite. Yet, apart from some outrage over Nixon's disparaging remarks about religious and ethnic groups, the public impact of the new tapes has been practically nil, a virtual drop in the water compared to the Wiki-tidal wave. Let's be fair: In terms of shear scope, the Wikileaks cables are unprecedented, comprising reports from every country with which the United States has diplomatic relations. An unauthorized leak of this magnitude is only possible in our contemporary era. At the time the tapes were recorded, a similar leak would have required either smuggling at least 1 million pages of documents out of a government agency, or photographing the same. At five seconds per shot, the latter would have taken more than 57 days without sleep. Still, in their own time, the Nixon tapes were nothing short of precedent setting. The existence of the tapes was first revealed in July 1973, at which time the country was shocked to find that conversations of the highest ranks of power had been recorded. And at over 3,700 hours, the tapes are every bit as expansive as the cables. Beyond their scope, Nixon's conversations are arguably just as interesting, if not more, than just about anything in the leaked cables. Not only do the recordings cover a variety of foreign issues, they also discuss U.S. domestic matters, which are rarely mentioned in the telegrams. The latter are Foreign Service reports from the field and orders from the State Department, most of which were written by second or third-tier officials, at least two degrees of separation from the upper ranks of power. The tapes, by contrast, offer a direct view into the conversations of the president and his inner circle, as well as visiting American and foreign dignitaries. Yet, most of the conversations on these recordings will never be fully transcribed, and some may not even be fully listened to for years. Why? For one thing, the public might naturally be more interested in documents primarily from the last five years rather than a bunch of 38-year-old recordings. The latest Nixon recordings come from February and March 1973, when the young Julian Assange had not yet celebrated his second birthday. For many, it is hard to remember that these tapes once had an even greater impact on the United States and the world than Wikileaks could have ever done, bringing down an entire presidency. But it is also a matter of image. The Wikileaks saga features the latest and greatest database and encryption technology, even though it involves no actual wikis, while to many, the Nixon tapes seem as dull as their grandfather's 8-tracks rotting in the attic. The recordings are often of poor quality, full of skips and scratches. Would-be history sleuths have to strain their ears to decipher the banter. Those who have the time to do so may be rewarded by the added meanings that the tone and inflection of the participants give to the conversation, but this is a time-consuming enterprise. Perhaps because of these challenges, the media has focused on the tapes' most sensational aspects. The most popular reports have been on Nixon's frequent use of slurs and stereotypes, which should not surprise anyone who has read virtually any book about the man. Such comments are particularly easy to find in these tapes, because they are often conveniently listed under subject headings that read like an entry from the index of a book of ethnic jokes, such as "Blacks" and "Italian, Mexican, Polish-Americans." Walking into a bar, were they? In the corresponding recording, Kissinger comments that "the emigration of Jews from the Soviet Union is not an objective of American foreign policy. … And if they put Jews into gas chambers in the Soviet Union, it is not an American concern. Maybe a humanitarian concern." Presto, instant headline: Kissinger says gassing Jews isn't an American concern. Heard in its context, however, this statement takes on a different meaning. Kissinger made this remark in a discussion with Nixon about Israeli encouragement of Congress to deny a preferential trade status to the Soviet Union, because of its refusal to allow its Jewish population to emigrate freely. 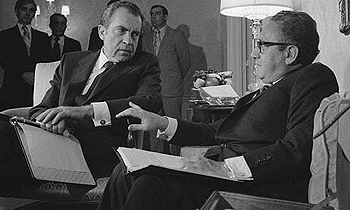 The Israeli position interfered with the U.S.-Soviet rapprochement that Nixon and Kissinger had sought to foster through their policy of détente. Kissinger's words thus reflect his adherence to the foreign policy doctrine of realism, the belief that relations between states have to be based on concrete interests and power, rather than idealistic concerns of humanitarian—hardly a Hitlerian notion. They also may have been an attempt to keep the favor of a president who remained skeptical about the ability of a Jewish advisor to be objective about questions of U.S. policy on the Middle East. Kissinger's comment may be callous, but it doesn't mean that he was indifferent to the fate of Soviet Jewry. Press reports that have presented this comment by itself, however, seem to underline a view common among American and Israeli Jews that Kissinger was indifferent to the fate of Israel. Few, if any, have stepped forward to defend him, in America or abroad. The Jerusalem Post ran an editorial praising Nixon, who on these tapes says much worse things about Jews, while saying nothing to excuse Kissinger. That said, there is plenty of new material left for researchers to dig through, particularly on foreign policy issues such as Vietnam and the Middle East. In January 1973, the United States and North Vietnam signed the Paris Peace Accords, which many historians have seen as designed to produce a "decent interval" for the United States government to pull out of South Vietnam before the government there collapsed. The conversations during these months discuss the return of American POWs, the withdrawal of American troops and North Vietnam's adherence to the ceasefire. While there are no startling new revelations on the Middle East, the tapes document U.S. reactions to Israel's downing of a Libyan passenger jet that had strayed near its territory and the assassination of two U.S. diplomats in Sudan by Palestinian guerrillas linked to Yassir Arafat's Fatah organization, as well as the American desire to continue its mediation in the Arab-Israeli conflict. The president is also heard commenting on a variety of domestic U.S. issues, among them some controversial ones. Nixon was known for his strong opposition to the legalization of marijuana, even after a commission that he himself appointed recommended its decriminalization. In March 1973, yet another commission, this composed of 38 eminent citizens of Washington, DC, issued a report advocating the same step. In these tapes, he tells the visiting DC Chief of Police of Washington Jerry Wilson that "I was horrified to see these distinguished citizens of District of Columbia come out in favor of the legalization of marijuana. ... I don't think marijuana is that bad, but it's the wrong signal." Nixon's attitude on the issue, it seems, was largely determined by how he thought the public would interpret his position. "Tough on crime" goes back a long way. One area in which these new releases will disappoint is Watergate, which has remained the defining moment of the Nixon presidency. So far, the only revelation to come out is that Billy Graham called Nixon to offer his support during the crisis. Yawn. Most of the recordings dealing with Watergate were already released more than a decade ago. However, when these conversations are heard in the context of the rest of the tapes, one does see just how much of Nixon's time was spent dealing with the impact of the scandal, which would not reach its peak until the following year. The last batch of the Nixon tapes is due to be released in 2012, but these are unlikely to fare much better than the current ones relative to Wikileaks. Of course, one could argue that the importance of both the cables and the tapes is not simply what they say, but how the public has interpreted them, rightly or wrongly: as symbols of the arrogance of power. Yet substance has a value, and there is arguably more of it in the tapes. These recordings may be scratchier and earthier, but they are ultimately more revealing. James Stocker recently finished his PhD at the Graduate Institute of International and Development Studies, where he wrote his dissertation on U.S.-Lebanese relations during the Nixon-Ford administration. During his research, he listened to many of the Nixon tapes on the Middle East. He is currently based in Washington, DC.